RBTH presents a selection of views from leading Russian media on the latest developments in Ukraine, featuring widespread reaction to the imposition of yet another wave of sanctions against Russia by the U.S. and the EU, as well as news of Russian aviation experts’ assessment of the data retrieved from the MH17 black box recorders. The Kommersant newspaper reports that the U.S. and the EU have agreed on another set of restrictive measures against Russia. The newspaper writes that the countries have agreed to expand the black list of persons who will be denied entry into the EU and whose assets are to be frozen. Referring to Western media, Kommersant says that the new blacklist includes four representatives of major Russian businesses and three Russian companies, including one bank. The newspaper adds that the countries have also agreed on a set of measures in the field of transport and communications, which will hamper commercial cooperation between European and Russian companies and Crimea. The countries also discussed the introduction of measures to make access to the capital markets of the EU difficult for Russian banks, as well as the introduction of an arms embargo. Kommersant refers to the estimates of the European Commission, according to which in the case of sanctions, Russia’s losses may amount to almost €100 billion over two years. According to the newspaper, the agreement reached by the permanent representatives on economic measures has yet to be approved by the foreign ministers and leaders of EU countries. The publication refers to the words of its Russian diplomatic sources, saying that the Russian authorities are hoping that in the course of negotiations at the highest level, these sanctions will be substantially mitigated. However, according to the newspaper, the U.S. State Department believes that there will be no easing of measures on the part of the EU. Nezavisimaya Gazeta expresses the view that economic sanctions may be painful for Russia. The newspaper explains this by the fact that Russia holds a significant part of its foreign exchange reserves of $500 billion in the form of securities, but cannot provide its economy with dollars or euros without some part of these transactions having to go through the American or European payment systems. The newspaper refers to the forecast made by Wolfgang Münchau, editor of the Financial Times, who argues that, although the money belongs to Russia, the systems are subject to U.S. and European laws. He predicts that in the extreme case, the Russian Central Bank’s assetsmaybe frozen, and the rest of the Russian economy will be cut off from the capital market. In this case, Münchau believes that the Russian economy could collapse within a couple of weeks. However, according to Nezavisimaya Gazeta, this situation also carries risks for the West, since it undermines confidence in its currencies. Despite this, according to Nezavisimaya Gazeta, the West is not going back on anti-Russian sanctions. Nevertheless, the leaders of the United States, Germany, France, UK, and Italy, according to Nezavisimaya Gazeta, have expressed hopes that the Russian leadership will cooperate. 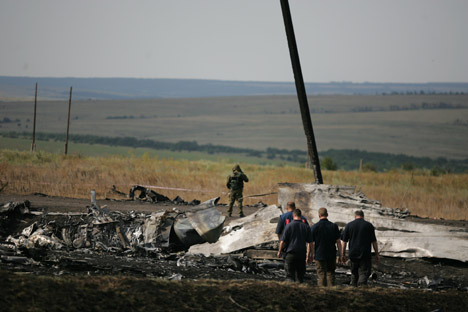 The Vzglyad newspaper tells its readers that Russian aviation experts working with an international team in investigating the causes of the downing of the Malaysian Boeing in Ukraine believe that the information obtained from the flight recorders only indirectly confirms the hypothesis of a missile strike. The newspaper reminds its readers that on July 28, Andrey Lysenko, a representative of the Information Center of the National Security and Defense Council of Ukraine, made a statement. Lysenko said that the results of decoding the recorders from the Malaysian Boeing 777 suggest that the plane crash occurred due to a massive explosive decompression as a result of numerous shrapnel penetrations from a missile explosion. However, Russian experts, according to the newspaper, insist that data from the Boeing recorders is not sufficient to provide a complete picture of the incident. The author of an article titled “You should not pay blackmailers” in the Expert magazine opines that the EU’s willingness to succumb to U.S. pressure and impose sanctions against Russia could turn out to be a serious strategic blunder. The author writes that Brussels is forcing Vladimir Putin to make a choice: either to give up the protection of Russia’s national interests and undo all the achievements of Russian diplomacy in recent years, or enter into a serious confrontation with the West. “It is easy to guess which option, in this case, the Russian president will choose,” says Expert. The magazine warns that these sanctions will also hit Europe as well. Gazprom will remain a vital supplier of gas to Europe, says Expert.